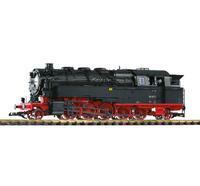 Locomotives and railcars of the PIKO G-scale range impress with a high level of detail and modern technology. PIKO G trains and accessories are built of incredibly robust and weather-resistant materials to make sure that they can be enjoyed indoors and outdoors for many years. All locomotives and railcars can be upgraded with digital decoders and sound.